Every time I taste champagne, I virtually have to slap my hand away from my wallet. I taste it, and I want to own more of it. 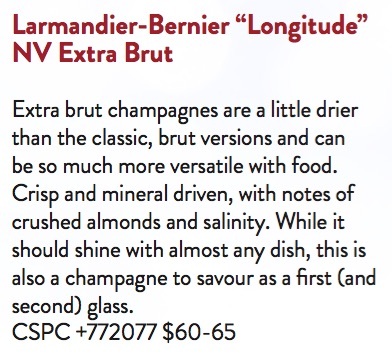 These wines are always a pleasure to taste, but I’m wondering why we don’t drink more champagne more regularly? It certainly isn’t inexpensive, making it more of a special occasion rather than a Saturday night wine for most of us, but there are plenty of good alternatives for midweek bubbles. Champagne only comes from northeast France, and is time- and labour-intensive, but this results in a depth and nuance that differentiates it from cheaper sparkling wines. Champagne really is the king of the hill when it comes to sparkling wines. This holiday season, while you might be splurging on a bottle of champagne (and we have a few recommendations below), please think on this age-old question, why aren’t you drinking more champagne?